In my last post, I invited you to join me in an online community (She Reads Truth) that is reading through 1 Peter, and mentioned that I would be posting my thoughts primarily on the Facebook Fan Page I have set up for Feeding a Hungry Soul. "rid yourselves of all malice and all deceit, hypocrisy, envy, and slander of every kind." My thoughts turned to a conversation I'd had with my daughter the day before as she shared that her baby preferred nursing still over solid food. There are some things he will eat, but most things she said he turns his head away from and even throws them if really not interested. He is healthy and definitely growing BIG...so obviously he is getting the nutrition he needs. of what we are called to do as believers. BUT WE ARE TO RID OURSELVES OF ALL THAT IS NOT PURE SPIRITUAL MILK. Am I like my little grandson? Do I turn my head with great force and intentional disdain from all that this world wants to entice me to eat? Do I 'rid myself of all malice and all deceit, hypocrisy, envy, and slander of every kind' with the same demonstrative nature that my grandson throws his food? I'll be meditating on this thought today and asking God to show me what I need to RID myself of. Not just be aware of it but actually RID MYSELF OF IT! 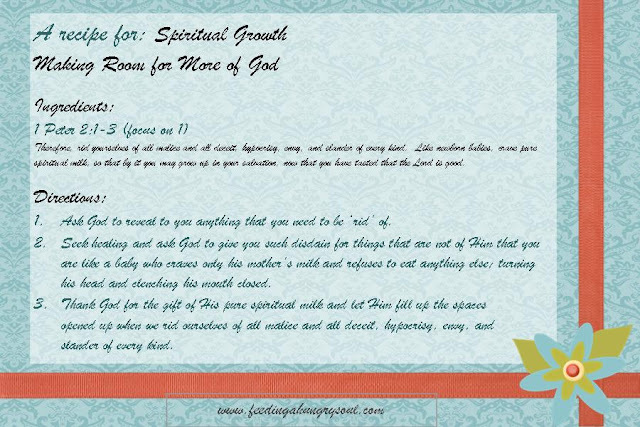 I know that this is all because God wants me to make room for More of Him!! Lord God, I am humbled by Your word today as much as I am blessed by the knowledge that You prepare meals for me daily to strengthen my walk with You. Thank You for making me mindful of the things You still desire for me to be rid of. Thank You that the purging process gives me room for more of Your pure spiritual milk. Thank You for this deep love You have for me.I come before You in the name of my Savior, Jesus Christ. Amen. The directions are to ask God to show us what we need to be 'rid' of so we can repent and receive more of His pure spiritual milk.